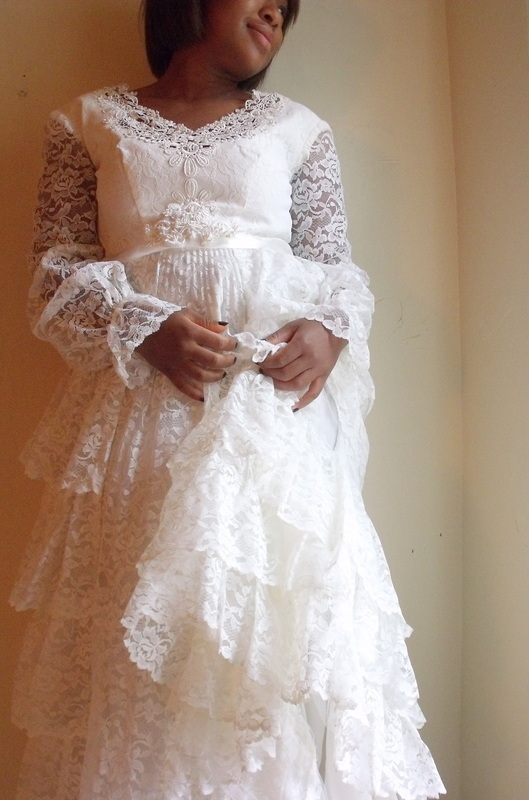 Vintage Wedding Dress. From the stitching inside I can tell it was custom made by hand. Today I was listening to an NPR story about 300 factory workers who died in a fire. It was a clothing manufacturing factory. Once again the issue comes up of cheap labor for the benefit of, not the people living in the country where the cheap labor exsists, but for a place that is a world away. While buying vintage may be a trend to some it also has an unexpected benefit. One we may not often think of. While it doesn't change what's happening, for those who care and are concerned about the well being of others, it's a way to lessen demand for cheap labor. The labor that took the precious lives of 300 workers. It gives us a chance to find unique well made pieces,often made close to home, and for that moment of purchase clear your conscience. No this won't eradicate this problem but for those who are concerned it's an option and choice. I have been acquiring and wearing vintage clothing since a very young age. It is my pleasure to share some everyday vintage finds with you.